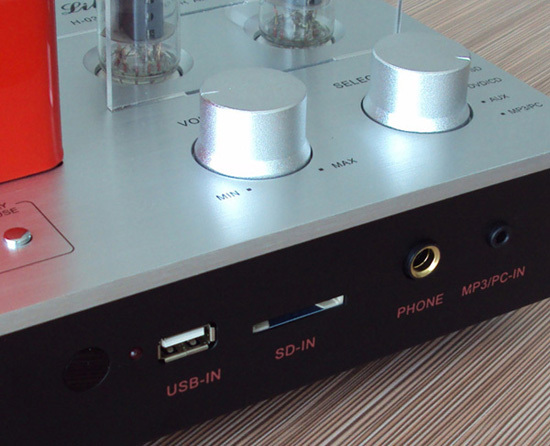 This is a multifunctional HiFi amplifier: H-03A is a small tube and transistor hybrid power amplifier. Good listening, warm tone, superior resolving. The machine retains the CD/DVD, AUX input for pure music lovers.Connection high quality audio source, such as desktop CD machine, DAC decoder, a small pure Hi-Fi music system, can get the full play to the machine tone quality. 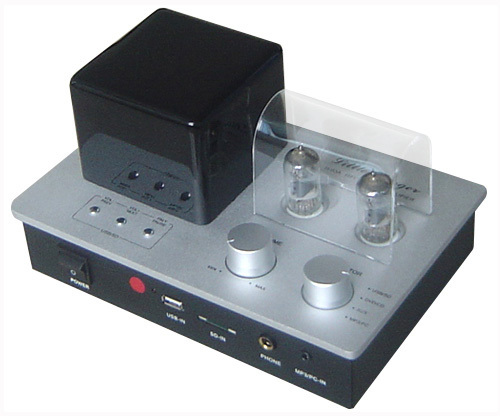 Headphone amplifier output is also designed , headphone amp parts directly using the machine power amplifier circuit, driver is better, Can connect 32-600Ohm Hi-Fi headphones to enjoy music, insert the headset automatically disconnect the output of the power amplifier to loudspeaker box. 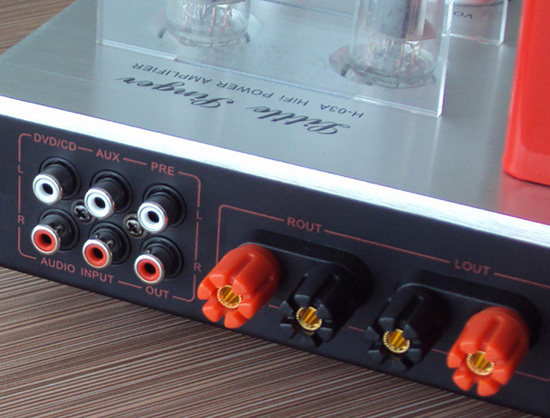 The former output interface is also designed, can be separately as a evacuated tube former, when connect to a pure latter amplifiers, listening improving. The output power of 15 w x 2,match the 4 inch small sound shelves box drives sounds nice, she can even promote some large diameter loudspeaker box. Appearance beautiful, workmanship exquisite, fine warm sound. Both tube amp warm exquisite timbreand transistor amp speed and strength. 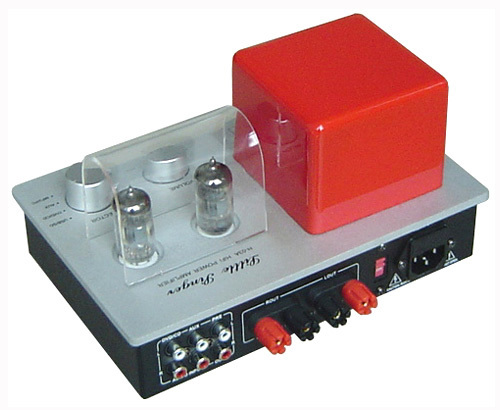 A really tube is applied to make pre-amplifier (not cathode buffer, not decorate false tube amp). The latter power amplifier is linear integrated power amplifier block imported from the Philipps. Sound quality and tone is incomparable. 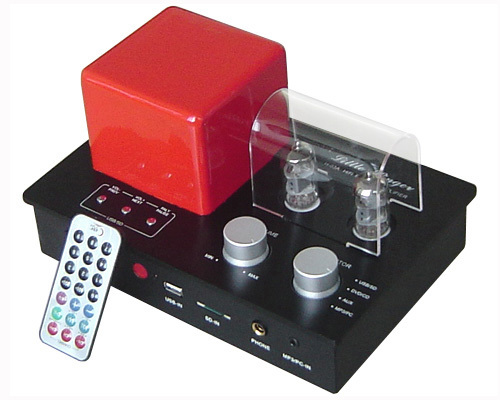 With 4 road signal input switch function: USB/SD input;CD/DVD input;AUX line input;MP3 / PC input. Bring U disk/SD card decoder, can put the MP3 files the downloaded from your computer copy into USB mobile storage, insert the machine interface, you can enjoy free online music files. Built-in headphone output, can connect different impedance headphones from 32 Ohm to 600 Ohm to enjoy music (after headset insert, automatically cut off the loudspeaker box). Power transformer adopts independent segregation of shielded enclosure, with low magnetic leakage toroidal transformer power supply,to the greatest degree reduces the interference, power supply abundant. Adopting advanced wrinkle paint or car paint process mask. 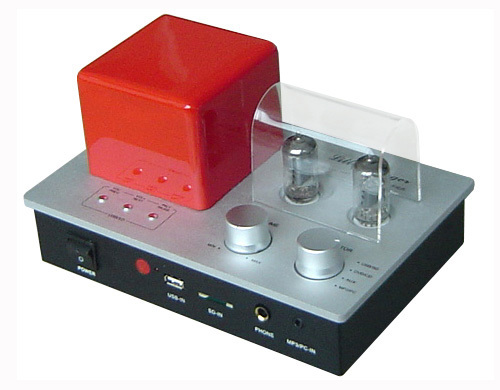 The volume uses Taiwan W.L potentiometer. German WIMA red MKP capacitive coupling. Senior gilded power output terminals.